Rivers, such as the Sapta Sindhavah ("seven rivers" Sanskrit: सप्त सिन्धव), play a prominent part in the hymns of the Rig Veda, and consequently in early Hindu religion. It may have been derived from an older Proto-Indo-Iranian hydronym, as a cognate name, hapta həndu, exists in the Avestan language. It is not entirely clear how the Seven Rivers were intended to be enumerated. They are often located in northern India / eastern Pakistan. If the Sarasvati and the five major rivers of India are included (Sutudri, Parusni, Asikni, Vitasta, Vipas (Vipāś), the latter all tributaries of Sindhu/Indus), one river is missing, probably the Kubha. (The Sindhu is a special case, having feminine or masculine gender). Other possibilities include the Arjikiya or Sushoma; compare also the list of ten rivers, both east and west of the Indus, in the Nadistuti sukta, RV 10.75. In 6.61.10, Sarasvati is called "she with seven sisters" (saptasvasā) indicating a group of eight rivers, the number seven being more important than the individual members (see also saptarshi, hapta karšuuar /haft keshvar in Avestan), so that the list of the Sapta Sindhava may not have been fixed or immutable. In RV 10.64.8 and RV 10.75.1, three groups of seven rivers are referred to (tríḥ saptá sasrâ nadíyaḥ "thrice seven wandering rivers"), as well as 99 rivers. The Sapta-Sindhava region was bounded by Saraswati in the east, by the Sindhu in the west and the five in between were Satudru, Vipasa, Asikni, Parusni and Vitasta. Not all researchers agree with this interpretation. In his book Land of the Seven Rivers, writer Sanjeev Sanyal has argued that the "Sapta Sindhu" refers only to the Sarasvati and its own tributaries. If Sanyal is right, the Sapta Sindhava region only refers to a small area including Haryana and a part of north Rajasthan but leaving out most of Pakistan. According to his interpretation, "Sapta Sindhu" is only a small subset of the Rig Vedic terrain and its disproportionate importance derives from it being the original homeland of the victorious Bharata Trutsu tribe. Identification of Rigvedic rivers is the single most important way of establishing the geography of the early Vedic civilization. Rivers with certain identifications stretch from eastern Afghanistan to the western Gangetic plain, clustering in the undivided Punjab (the region's name means "five rivers). 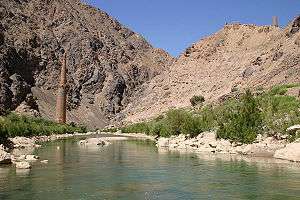 Some river names appear to go back to common Indo-Iranian rivers, with cognate river names in Avestan, notably the Sarasvati (Avestan Haraxvaiti, Old Persian Hara(h)uvati) and the Sarayu (Iran. Harayu, Avestan acc. Harōiiūm, mod. Persian Harē). A number of names can be shown to have been re-applied to other rivers as the center of Vedic culture moved eastward from the central Vedic heartland in undivided Punjab. It is possible to establish a clear picture for the latest phase of the Rigveda, thanks to the Nadistuti sukta (10.75), which contains a geographically ordered list of rivers. The most prominent river of the Rigveda is the Sarasvati, next to the Indus. 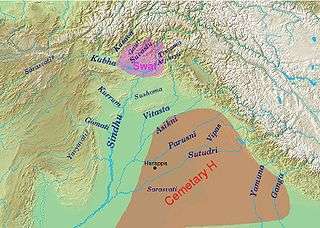 The Sarasvati river of the Rigveda is commonly identified with the present-day Ghaggar-Hakra, although the Helmand River as a possible locus of early Rigvedic references has been discussed. This is sometimes ascribed to the supposed movement of Vedic Aryans from their early seats in Seistan (Arachosia, Avestan Haraēuua), Gandhara and eastern Afghanistan into the Indus plains and beyond, though there is no archaeological evidence for such a movement. On the other hand, archaeologists like B.B. Lal have shown the possibility of reverse westward movements of some Indo-Aryan clans from the Indus basin as well as the absence of a certain archaeological trace for any outside intrusion to the subcontinent.